Throughout his career, trombonist Craig Parmerlee has created hundreds of arrangements for various organizations and ensembles to help them realize their musical visions. Today's technology provides him an opportunity to arrange the world's most beautiful songs the way he feels them. Today, using advanced computer technology, he has compiled a library of arrangements of the most popular tunes of the past 80 years. This technology allows him to perform these tunes live, accompanied by the computer-based arrangements. 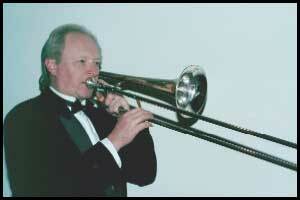 These widely varied styles provide a wonderful backdrop for Mr. Parmerlee's the lush, romantic trombone sounds. Mr. Parmerlee puts on a tasteful program that is ideal for wedding receptions, dinner parties and light dancing or mingling. This unique performance adds a touch of class to your special event and will be long remembered by your guests.